What are the Best dog crates for puppies? Wonder Dogs is available now on Amazon.com! Take a lively, amusing romp through nine decades of German Shepherd Dog films—beginning with the first German Shepherd movie star of 1921 and ending with recent releases. Jordan Taylor profiles 101 movies starring German Shepherd dogs representing 17 countries. The plot line is only part of the action, with much of the drama happening behind the scenes. Taylor delves into backstories with detailed historical information, bringing both obscure and popular movies to life in ways that will amaze and intrigue audiences. The German Shepherd Dog, an incredible superstar of early cinema provides a brilliant focal point for Taylor’s in-depth study. Taylor’s work shines a light on evolving technical, aesthetic and social sensibilities through the decades. Taylor’s eloquent narrative covers many aspects of the business not readily apparent to the casual film goer: How the advent of speaking impacted animal performers. Training methodologies and treatment of canine actors. Use of the dogs as agents of propaganda during wartime. In an industry known for it’s cutthroat and political past; the facts are often hilarious, at times disturbing and always fascinating. Whether you are trying to decide if a film is appropriate for your children or looking for a great read, Wonder Dogs is sure to enchant both dog lovers and film lovers alike. 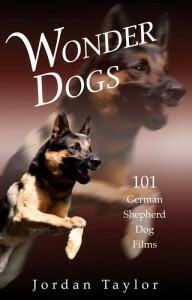 Please click here to see Jordan Taylor’s list of German Shepherd Dog films. Watch the Wonder Dogs trailer below! © Copyright 2019 Reel Dogs Press.